Bosch has recently expanded their 12V line of tools – good news for users that like the design of products like the FlexiClick multi-head driver. What interesting about the latest launches is that they’re not tools you expect to see on a 12V battery platform. Today’s case in point is the new Bosch 12V Edge Router. Let’s look take a tour through what you can expect and see where this compact router fits in the grand scheme of things. If you’re going to make a cordless router, especially on the 12V platform, you have to take advantage of a brushless motor. Bosch checks that box. Designing a cordless router like the Bosch 12V Edge Router begins with the question of how to position the battery and motor. With 18V systems, sliding the pack on top of the router is the best bet. 12V isn’t much different, but with a stick pack battery instead of slide, there’s a little more wiggle room. Bosch brings their battery in at an angle to the front of the motor, giving it an odd look compared to the other options out there. It’s the placement that allows you to keep your hand closer to the cutting edge and wrap your fingers around the front, giving you control as you pull the router across the grain. Rubber overmold helps maintain your grip and offers some comfort. With my medium size hands, I’m able to use the router pretty comfortably. However, it’s right on the edge of being too large for a comfortable grip. When you get in a pinch and need a little more control, the battery housing sticking up makes for the perfect place to add a second hand. You’ll need an included wrench to change router bits. To lock the collet, just pull the red bar above it out. You may have to rotate the collet a little until you find the right placement. Depth changes are pretty simple. A button on the left side releases base for rough depth setting the thumb wheel just below it gives you fine adjustments. On the right side, a twist of the knob locks the base at the depth you set. To set a clear expectation, this isn’t a DIY router or something designed to do what your corded or 18V routers can do with a shorter runtime. This is a palm router or edge router. With 13,000 RPM to work with, it’s well under what you see from trim routers, including on the cordless side. As long as you’re using the router for light edge routing and trimming, it’s not going to be a problem. I ran the router through some tests with a 1/4″ x 1/2″ beading bit and a 22° x 3/8″ bevel bit and am impressed with the confidence the motor delivers. The key to getting the best performance from the Bosch 12V router is to take your time, especially in hardwood, and let the motor do the work. Expect this one to retail for right at $150 as a bare tool. It’s starting to make its way to online retailers now, though it’s not terribly widespread just yet. The Bosch 12V Edge Router is an excellent solution for wrapping up trimming and edging, especially for job site carpenters. 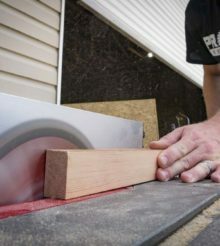 When you produce most of the build at the shop and have to make some slight tweaks during installation on site, it’s a huge help to bring out this 2.2-pound router and leave your corded trim router in the truck or back at the shop.